Augustus Whittlesby has been a spy for a very long time. He’s spent a decade in Paris posing as the world’s worst poet and sending secret information back to England hidden in hideous poems. Augustus is starting to tire of the spying game–after all he’s starting to rhyme and alliterate even in his thoughts and everyday speech–when he hears of a device that Napolean has acquired to invade England. Not knowing what the device is or really any details whatsoever, Augustus needs to infiltrate the soon-to-be Emperor’s court. Enter Emma Delgardie, American ex-pat and a close friend of Napolean’s wife and step-daughter. Since being widowed 4 years prior, Emma has spent her days floating from party to party and criticizing Augustus’s terrible poetry. Faced with the option of staying in France or returning to America, Emma agrees to write a masque for the Bonaparte’s upcoming house party in order to postpone having to make any decision at all. Augustus sees his way in and soon the two are collaborating on the most ridiculous play that France will ever see. Seriously, there’s a character named Americanus, and a pirate queen, and I don’t know what else. Of course, Augustus and Emma grow a lot closer while writing their masque which leads to all sorts of complications. Will Augustus be able to let down his long-held guard and save England? Will Emma be able to let go of her comfortable life and forgive Augustus for the fact that he’s been using her when she inevitably finds out about his true identity? Probably. This is a fluffy romance, after all. And I mean that in the best possible way. As the ninth (!) book in the Pink Carnation series, The Garden Intrigue (Dutton 2012) could have been stale or a rehash of the older books. Luckily, Lauren Willig is able to keep things fresh by varying the locations, spy plots, and most importantly: the main couple in each novel. A boring central couple (ROBERT AND CHARLOTTE) can really drag down the whole novel, but Augustus and Emma are intriguing characters, both separately and together. They both have a world-weary, been-around-the-block thing going on that I personally find so much more interesting than a gee-whiz, puppy love type relationship. 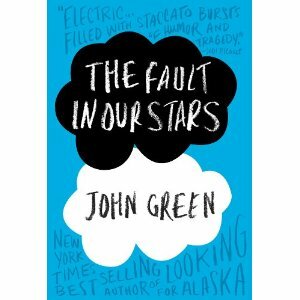 The dialogue sparks between the two characters, but also deepens as Augustus and Emma start to shed the pretenses they put up for the rest of the world. And they’re both amusing rather than mushy, which is always appreciated. The spy plot was perhaps not quite as actiony as I prefer, but still good nonetheless. The mysterious device actually was dangerous and there were lots of eavesdropping of conversations and tension-filled coded messages. Jane and Ms. Gwen both popped up, though there wasn’t NEARLY enough of the latter. Seriously, she didn’t get to hit anyone with her parasol or blow something up once. I’m only mollified by the fact that Ms. Gwen will be the heroine of the next novel in the series. Spoiler. And of course, I shouldn’t neglect poor Colin Selwick and Eloise Kelly. Eloise is a Harvard grad student doing archival research in England on Napoleanic era spies and Colin is the descendant of the Pink Carnation who possesses said archives. Colin and Eloise only get 6 chapters per book so they not only provide the framing device for the main narrative (it involves the characters Eloise are currently researching), but their little story usually parallels the historical plot. I think that this novel actually contains the strongest Colin and Eloise story in awhile. They haven’t been terribly interesting ever since the two started dating, but The Garden Intrigue has some good Selwick family drama as well as a classic boyfriend vs. career dilemma for Eloise. At the book signing that we attended two weeks ago, Willig revealed that she’s ending the series with the eleventh book (which I think is smart), and I could definitely see hints of Colin and Eloise’s story wrapping up. For the first time since book 3, I’m actually interested to see where these two go next. 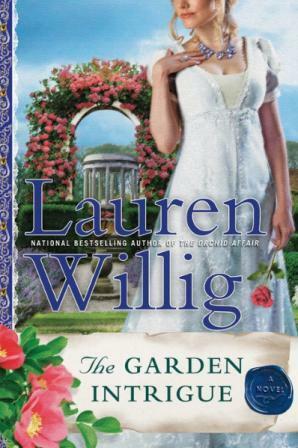 The Garden Intrigue is another strong entry to this funny, adventurous, romantic, and clever series. If any of that interests you, start at the beginning and check out The Secret History of the Pink Carnation. You can thank us later. Or not. It’s entirely up to you. Last night, Sword Mistress, Captain Awesome, Princess Consuela, and I braved the wretchedness of I-85 north at rush hour to see the fabulous Lauren Willig at Georgia Gwinnett College. If you aren’t familiar with her work, Willig writes an addictive series of novels about spies in Regency England and France, all named after flowers. “Intrigue. Espionage. Romance. Swordplay. Comedy.” is how her website describes her work, which sums them up nicely. I can’t remember which Rampant lady first discovered these books (i think it was Princess Consuela), but we’ve all become addicted – some of us more than others – so when we heard she’d be heading to Georgia for a visit, we marked our calendars accordingly. Willig was promoting her latest book, the 9th in the Pink Carnation series, and we were lucky enough to be the first stop on her tour. The Garden of Intrigue comes out today (happy book birthday! ), but happily her publisher agreed to let copies be sold last night, so we all got our greedy paws on one. Willig was adorable – she obviously enjoys the hell out of writing these books and gets a kick out of the scrapes and love entanglements she gets her characters into. 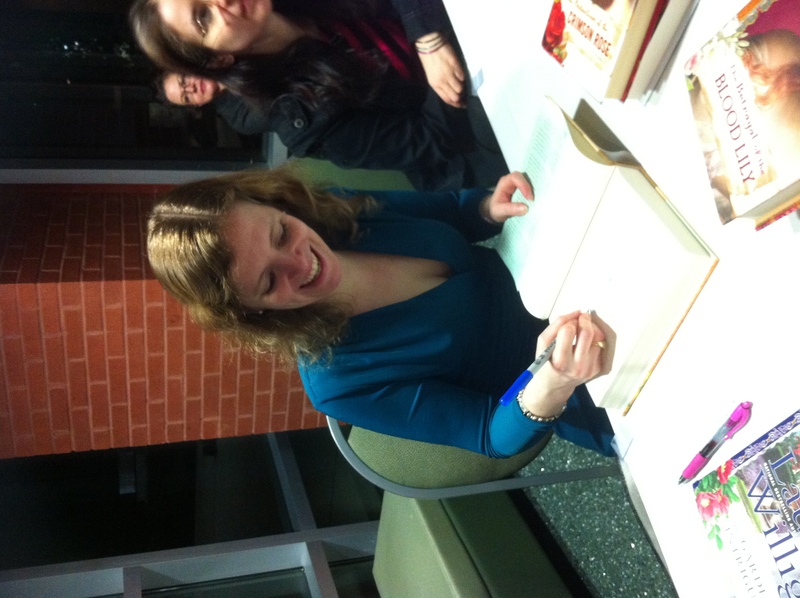 She read two passages from the new book, both of which had us giggling. She then answered questions about her writing process, what’s her plan for characters from past books, and the headache of choosing titles and covers for her novels. She answered every question with a smile and seemed excited to share the inside scoop on the inner life of her characters. Her true sweetness and affection for her fans came through when she signed. Not only did the four of us approach her in a pack and proceeded to linger and chat all together with her as she signed each of our books, but Princess and Captain had brought their entire collections of her books. This didn’t phase her in the least and she happily signed them all and didn’t freak out at our loud and extremely chatty selves. A cool bonus awaited us at the signing table. Willig’s first book, The Secret History of the Pink Carnation, when it was re-released had a bunch of illustrations, graphic-novel style. The illustrator is a Georgia lady, so she was there with the illustrations! They looked amazing, the illustrations managing to be both beautiful and capturing the humor and playfulness of Wiilig’s book. 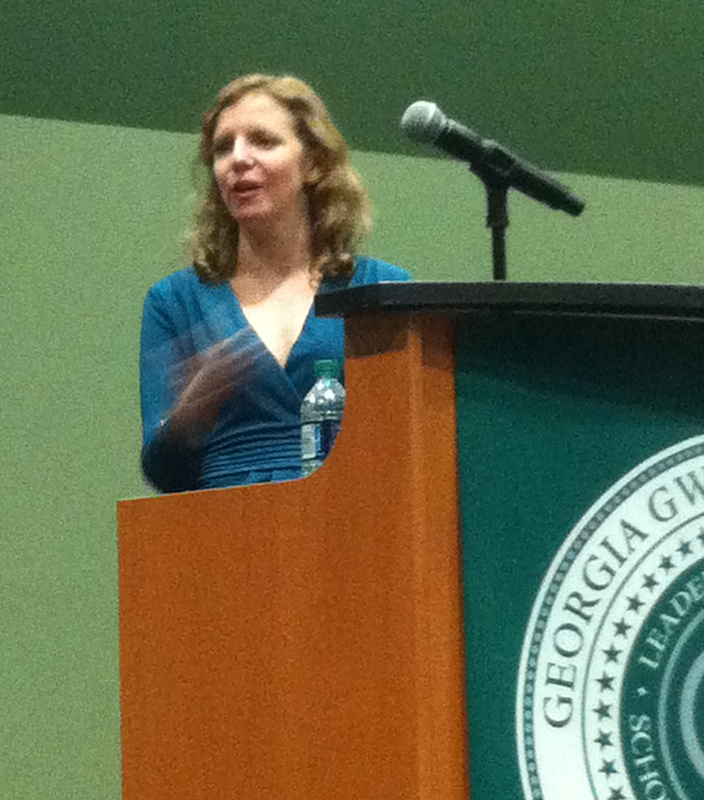 Thank you, Lauren Willig for coming and thanks to the Gwinnett Library system and Georgia Gwinnett College’s library for hosting a great event! Mr. Reginald “Turnip” Fitzhugh is a man in possession of good fortune. Ergo, he must be in want of a wife. It is, after all, a truth universally acknowledged. So saith Jane Austen. </geek> If you’ve read the previous Pink Carnation books, you’ll remember Turnip as a flashy, bumbling side character who occasionally serves as a distraction to the dastardly French while the Pink Carnation and her League do the serious spy work. Since he can come across as a bit of a blithering idiot (remember when he tried to pour coffee out of a pot that was used to smuggle in a pistol? facepalm), I was concerned about him having a starring role in The Mischief of the Mistletoe (Dutton 2010). I shouldn’t have worried, though. Turns out that he is pretty endearing when he gets his moment in the spotlight. You’ll also be relieved to know that he’s not as dimwitted as you may have feared. When he’s trying to impress Miss Arabella Dempsey, he reads up on the history of Farley Castle and is able to discuss it like an intelligent person. Okay, maybe “intelligent” is too strong a word. Let’s go with me no longer worrying that he’s dumber than a box of rocks after this little convo with Arabella. I actually breathed a sigh of relief at this point – this is what convinced me that he wasn’t a complete buffoon and that there was hope for him to be an interesting character. The newcomer and Turnip’s costar in this Pink Carnation adventure is Arabella Dempsey. Until recently, Arabella was companion to her Aunt Osborne in London where she propped up many a ballroom wall during her seasons there. Aunt Osborne has recently married a much younger man (SCANDALOUS), and Arabella has taken her leave of the newlyweds to become a school teacher at Miss Climpson’s Select Seminary for Young Ladies to make her own way in the world. She sums up her situation pretty succinctly: “I am a woman, and I am poor” (I feel you there, Arabella), and she needs to work so that she does not become a burden on her ailing father, who has three other unmarried daughters at home to support. Turnip literally runs into her one day after visiting his sister at Miss Climpson’s. Though they’ve met before, this is the first time Turnip ever notices Miss Dempsey, who has perfected the art of being completely unnoticeable. Once he’s noticed her, though, Turnip makes a point to remember her, and once he suspects that she is in danger, protecting her. He’s quite the knight in shining armor, sitting outside her window for several nights in a row to be sure that nothing untoward happens. Nothing like hunkering down in the garden on a bracing English December night to suggest more than just a passing interest. Unfortunately, Arabella suffers from an inferiority complex and doesn’t see it. In the face of a hot, rich, nice guy, she assumes that he’s uninterested in plain, poor, boring her. Not so, Arabella! He’s definitely into you. Don’t worry, though, guys. They work it out. In fact, you can read the continuation of the story here. NSFW. 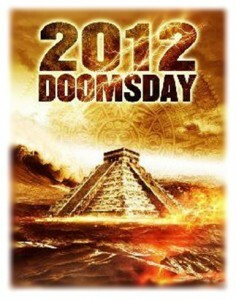 Consider yourself warned. This is another fun romp in Pink Carnation land with the added bonus of a cameo from Jane Austen herself. I could have done with more facetime for the delightfully condescending Vaughns myself, but a girl can’t have everything she wants. If it was up to me Lord and Lady Vaughn would upstage everyone all the time, so it’s probably best that I’m not in charge of these things. I also missed the serious spying that some of the other books include, but it was probably wise not to leave Turnip in charge of any explosives. He does take out the villain with a Christmas pudding, though, which was pretty ingenious. Put his lady love in danger and Turnip is quite inventive. Also a wee bit violent. It’s pretty satisfying to see the bad guys take a beating, though, so I’m not complaining. This concludes our message of holiday cheer. Merry Christmas, y’all. This is my favorite pop Christmas song. I like to think that Turnip would appreciate Elton’s sense of style.